Jonson Engineering & Foundry Co. When Mr. and Mrs. Julius Jonson of Mount Vernon, N. Y., celebrated their golden wedding anniversary in 1922, an announcement in the New York Times, 16 April 1922, p. 25, summarized Julius Jonson's career in the following terms, "When Mr. Jonson came to New York from Baltimore in 1870 he was appointed Assistant Engineer of the Department of Public Works. He invented the non-freezing fire hydrant. For some time he operated the foundry and shipbuilding plant at 118th Street and the Harlem River, and furnished the iron work for the first big apartment in New York, the Navarro, and the building of the 125th Street cable road." The Jonson iron works at 541 E. 118th St. were called Julius Jonson & Co. in 1882/83, Jonson Foundry & Machine Co. from 1883 to 1892, and Jonson Engineering & Foundry Co. from 1892 to 1899. 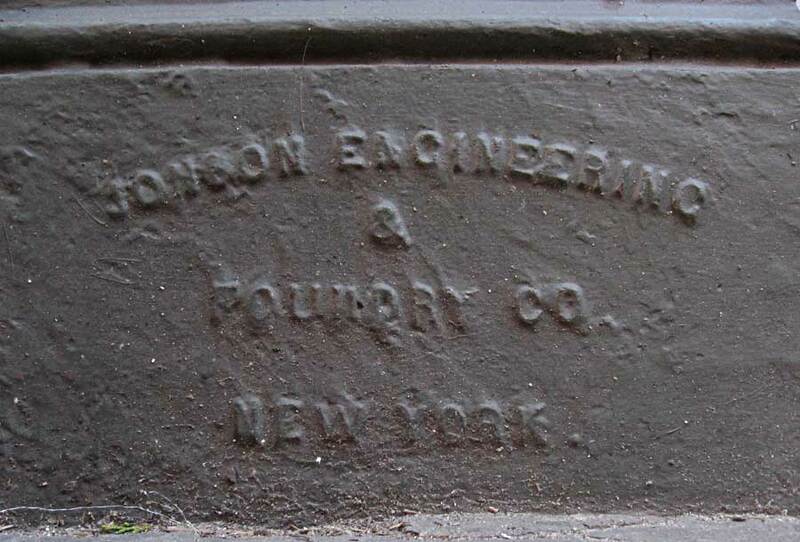 This foundry mark at 118th St. and Pleasant Ave. is inscribed Jonson Foundry & Machine Co..
Julius Jonson can be found in U. S. Census records from 1880 through 1920. They indicate that he was born Feb. 1845 in Germany (the 1880 census identifies this as Prussia) and immigrated to the U. S. around 1848/49. IRS tax assessments show that Julius Jonson & Co. were located at 338 Pratt St. in Baltimore, Maryland, in 1865. The business is described as Iron Work, and the tax was $5.40 in June, 1865, but $81.00 in September, 1865. In 1866 Jonson lived at 75 Howard St., Baltimore, and he was taxed on his income, a carriage, a watch and a piano. During his Baltimore years, Jonson was awarded patents for "Improved Apparatus for Separating Metallic Filings" (24 Jan. 1865), "Improvement in Magnetic Machine for Separating Iron from Brass Turnings and Filings" (27 August 1867), and "Improvement in Pumps" (12 Sept. 1871). His later inventions included an "Improvement in Hydrants" (Patent No. 214,922 dated 29 April 1879), which consisted of "certain novel combinations of devices, in which the main valve of the hydrant has connected with it a combined guide and waste-valve, arranged below the main valve, whereby increased efficiency is obtained with little or no liability of the water freezing" (Click for image). In 1879 the New York City Board of Aldermen authorized payment to Julius Jonson of $1636 for fire hydrants. The 1880 U. S. Census (non-population schedules for manufacturers) recorded information about the Metropolitan Iron Works. They owned capital of $15,000 and raw material valued at $25,000. They employed as many as 38 workers with an average of 28. The work day was 10 hours, and skilled mechanics were paid $2.40 per day, ordinary laborers $1.25. Annual wages paid totaled $13,000. The value of the past year's production came to $54,000. In 1882 the journal Manufacturer and Builder included an advertisement for Jonson's Metropolitan Iron Works. The Navarro Apartments were located on Central Park South. Christopher Gray's Streetscapes article on the Navarro appeared in the New York Times, 17 June 2007. The development consisted of eight apartment houses facing Central Park on the west end of the block between 58th and 59th Streets, and 6th and 7th Avenues. The developer was José Francisco de Navarro, and the architects were Hubert & Pirsson. More about Philip Hubert can be found on my write-up about the Chelsea Hotel on www.14to42.net.